Full exterior view of Post Office (169 - 173 Middle Street), from southwest on Middle Street. Exchange Street at left; Market Street at right. Postmarked 20 September 1909. Published by The Hugh C. Leighton Company. 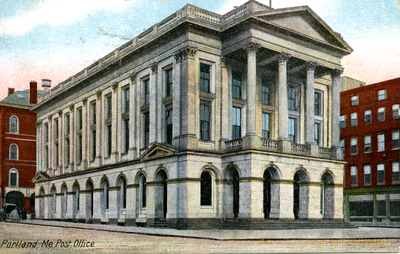 "Portland Me., Post Office" (1909). Portland Postcards. 28.